It's the end of the year, and it is time to look back and let the major events of 2009 pass by. Of course, Copenhagen was the event of the year for those interested in climate change. In my opinion, Tuvalu is the island (or set of islets, atolls and coral reefs) of the year. For some, they were the heroes of Copenhagen, for others, they were final proof that UNFCCC negotiations necessarily have to fail. Either way, Tuvalu exists, out there somewhere between Hawaii and Australia, but also in our discourses and in the virtual reality. Talking about Tuvalu means talking about climate change; the one is as imagined or real as the other. It's up to you to decide, after reading this story about an island of great complexity. Tuvalu is one of the world's smallest nations, with 12 000 inhabitants halfway between Hawaii and Australia. They managed to halt the negotiations in Copenhagen for two days and almost split the powerful G77 plus China group of 130 developing countries. Tuvalu demanded to keep atmospheric carbon to 350 parts per million compared to the 450 ppm as suggested by the IPCC. Tuvalu's president also demanded to lower the 2 degree limit to 1.5 degrees. climateprogress.org supported Tuvali and wrote: 'Tuvalu raises the bar'; NGOs and activists shouted Tu-va-lu and 'Tuvalu is the real deal'. They ask, how can a nation of 12.000 have the same power as China with 1.3 billion inhabitants? Is this still democracy? Of course, for them it is not. Obviously, Tuvalu serves well to think about climate change and how to deal with it. Tuvalu stands for the first nation with climate refugees, for the frightening effects of sea-level rise, but also for green or environmental hypocrisy; for instrumentalizing climate change to get more development aid, and for the impossibility to negotiate climate change in a forum like the UNFCCC. Andrew Bolt from Australia's Herald Sun wrote about Copenhagen: 'Nothing is real in Copenhagen - not the temperature, not the predictions, not the agenda, not the 'solution''. But how real is Tuvalu, and how does the reality of Tuvalu look like? In publications like this one, Tuvalu stands for the millions of climate refugees. Harald Welzer takes in his book 'Klimakriege' (climate wars) Tuvalu as an example and warning for what is expected in the near future, but then with millions of climate refugees, and he also raises the legal problems. This is one perspective on Tuvalu, but not the only one. Other voices doubt that Tuvalu is threatened by rising sea-levels and that the migrants are climate refugees. Various sources from New Zealand state that the University of Hawaii measured since 1977 a negligible increase of only 0.07 mm per year over two decades, and that if fell three millimeters between 1995 and 1997. Anyway, according to one source, Greenpeace employed Dr John Hunter from the University of Tasmania 'who obligingly 'adjusted' the Tuvalu readings upwards to comply with changes in ESNO and those found for the island Hawaii and, miraculously, he found a sea-level rise of 'around' 1.2 mm per year which, also miraculously, agrees with the IPCC global figure'. The journalist Michael Field and other blogs agree that sea level rise is not the reason for migration from the island. Instead, the threat from the sea is according to Field the result of a severe over-population on an island that is scarce in resources and jobs, from a profound pollution (and mismanagement) and an unusual World War II legacy - on the main islet, Japan built an airport which resulted in great land loss. Another report confirms that seismic events or hurricanes lead to severe floodings on the islands, but that this vulnerability is not due to climate change. Instead, there is not enough money to really protect the island, people take building materials from the atolls and so on. Furthermore, the migration to New Zealand is, according to these sources, due to economic reasons; the economic infrastructure of Tuvalu cannot support 12000 inhabitants. Tuvalu is a poor country. Its main source of income was selling their internet address .tv for some hundred million bucks. The president of Tuvalu carefully invests into a future based on climate change, as a journalist reports: 'The government of Tuvalu has obliged all the journalists, dutifully telling of the need for future relocation (...) and possible lawsuits against polluting countries'. To come back to Copenhagen and to Ian Fry, the spokesman of Tuvalu, who made such a 'strong and impassioned plea' in his speech. In many newspapers such as the Washington Post, Ian Fry is characterized as a person from 'very high up in the climate change', who does not live in Tuvalu but in Australia. Indeed, Ian Fry has a long career in international environmental and climate organizations on several continents, before he was hired by Tuvalu's government. But, according to his Ph.D. advisor, there is nothing wrong with that. Why not work for another country? Anyway, the world press likes Tuvalu, which is often presented as the first island threatened by the effects of anthropogenic climate change, with the first real climate refugees, and Tuvalu serves as a symbol of a future of 'climate wars' or mass migrations of climate refugees as imagined by Welzer and many others. Tuvalu plays this role effectively, in Copenhagen and elsewhere. What really puzzles me is that it is so difficult to find out the reality of Tuvalu, while obviously Tuvalu very much shapes the reality of climate change discourse. Obviously, Tuvalu is an island of great complexity. Is sea level rise there a fake or a real threat? Are the migrants climate refugees or not? Is Tuvalu the center of the world, or is it a negligible entity at the end of the world? Is it the center of the climate negotiations, or is it a nuisance for the big ones? In any case, it is one of the many places that the real world is made of, with real people living there. It should be more than only a pawn in the game of interests of the science & politics complex that makes up current climate negotiations. Instead, investigating the manifold networks that connect Tuvalu and the climate as well as Tuvalu and Copenhagen could teach us a lot about the reality of climate change. Hrald Welzer (2008) Klimakriege. Wofür im 21. Jahrhundert getötet wird. Fischer. Before humans started the industrial revolution sea level had already risen 120m in 18,000 years. Obviously the climate community knows that but apparently not the world's media and 98% of its customers. Otherwise "holding back the seas" by the world leaders at Copenhagen, especially for these small island nations, would be treated a little differently. If sea level can change by 120m without humans, it's hard to believe that the next 1m is all about us. Maybe it is, but even without any human influence there is surely every chance that sea level would be rising many meters more? 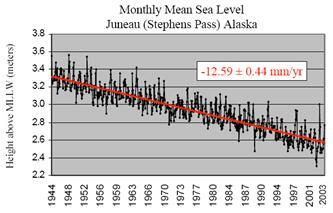 Nice article by the way, not so easy to work out sea level rise exactly for one location. Atolls usually grow together with rising sea levels, as Darwin discovered on his voyage with the Beagle. However, atolls are also very sensitive to pollution, ureum in particular. So with a population of 12000 on a coral island, Tuvalu is poisoning its own foundation, they can't blame the rich world for that. The same is happening in the Maldives. I have been to many Pacific atolls. And there is no way you can say Tuvalu is more "sunk" then the others. In fact, all of them are pretty similar in their height above sea level. Coral growth rate seems to be quite variable, apparently from 0,5 mm / year to 400 mm / year. But in any case they are capable to grow faster than any conceivable sea level change rate. "One of his most shocking discoveries was why the IPCC has been able to show sea levels rising by 2.3mm a year. Until 2003, even its own satellite-based evidence showed no upward trend. But suddenly the graph tilted upwards because the IPCC's favoured experts had drawn on the finding of a single tide-gauge in Hong Kong harbour showing a 2.3mm rise. The entire global sea-level projection was then adjusted upwards by a "corrective factor" of 2.3mm, because, as the IPCC scientists admitted, they "needed to show a trend". " Indeed. Tuvalu is very, very hard to pin down. For example, it's one of only a handful of countries with no official estimate of greenouse gas emissions. (Ironic or what?) Its population? Weirdly, nobody can decide whether its nine, ten, eleven or twelve thousand. Main export? Many current sources say copra but the Tuvalu Copra Trading Cooperative declared the copra industry 'dead' in 2005. (It has since been revived, not for export purposes but for the local production of biodiesel.) Main trading partner? Germany says Germany, Australia says Australia, Fiji says Fiji etc. Total exports? The German government says they were worth about 285,000 euros in 2007, the US government says 70,000 euros and the Australian government says that Australians spent 450,000 euros on imported Tuvaluan 'orthopaedic devices' alone. (Crikey!) GDP? Pick a number. It's either US$15 million or US$21 million or US$27 million - or, if you're the Australian government, you don't know how big it is but somehow you know how fast it's growing (by 1.5% last year). Does international aid make up 15% of GDP or more than 80%? (The latter claim was made in a study that also claimed that Fiji has a 'PPP-adjusted per capita GDP of over five billion US Dollars', so ...) Does the aid come mostly from Australia, the EU, the USA, Taiwan or somewhere else? Health. Have obesity levels increased or are they static? Petroleum imports. 1.2 million litres in total or 3.5 million litres not including LPG? The only uncontested data I can find about this ethereal yet emblematic island state is about the proliferation of NGOs in recent decades. Membership of the Tuvalu Association of Non-Governmental Organisations (TANGO) went from 7 in 1987 to 21 in 2000 to 34 in 2003 to 47 in 2009. At that rate, every last Tuvaluan will have his or her very own NGO by about 2080, which coincidentally is about the time that some people say the archipelago will go under. I think I'd rather drown. ¿La lluvia en Sevilla será una maravilla?